Colors: Silver and sky blue. Callimachans wear a silver tie. Values: Strong empowerment of the individual, the novel and innovative, respect for the old masters but obsessed with what is new. High style and haute couture. The world is always in flux, and they seek new ways to both learn from and affect this change. Fearless experimentation. Magic as art. Callimachus has always been the house that elevates the individual and then holds them up to scrutiny and admiration. They choose the unique and talented to join their Court, and hold them to high standards, expecting each to make a name for themselves in their creative expressions. Members must demonstrate strong aptitude towards at least two of Callimachus’ primary areas of academic focus (illusion, philosophy, magical theory, ancient languages, runes, fine arts). Often, prospective students applying to Imperial will send portfolios in advance to gauge whether they will find a place in Callimachus. All members are required to complete a Third-Year Thesis project. 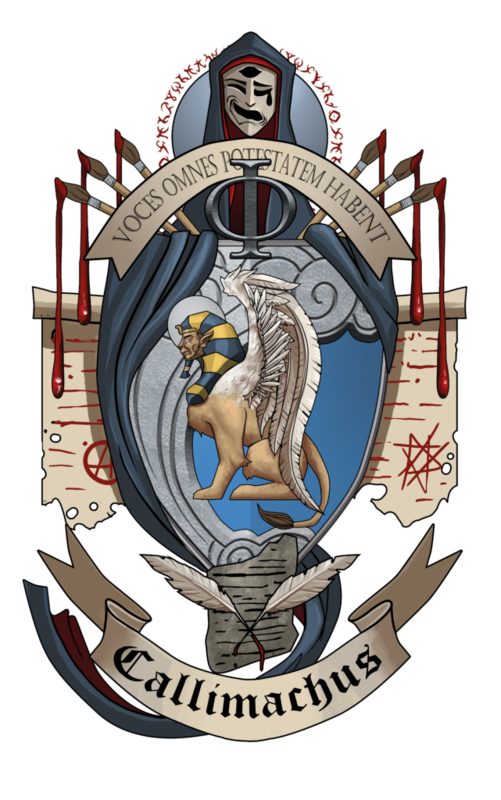 Some Callimachans distinguish themselves through works of art; many choose to illustrate their mastery of magic in physical manifestations, such as a codex of magical poems or modifications to spells. Other members delve deeply into theory and produce academic works furthering the understanding of a branch of magic. Some produce performance pieces, employing illusion and sensory magic, challenging existing aesthetics with magnificent threadcrafted costumes. Regardless of how they do express themselves, they are deeply invested in their own works. Callimachans can be seen, usually at a safe distance, trying out bold and new variants of magic. They are seldom seen without their respective items of trade, be it a sheath of scrolls, paintbrushes and an easel, journals and books, magical needles and bolts of cloth, bags of runes, and so on. Their artistic work is a central part of their respective identities. When Callimachans fail at their attempts, there’s always a Courtmate ready to help. In 2015, Parthenon Papegoja’s entire theater set imploded from an experimental scene-changing charm mere days before the performance; the whole Court rallied and rebuilt the set, with one of the students inventing a new runic method to limit the boundaries of psychokinetic forces. Everyone makes mistakes. Of course, repeated failures may be a sign that the secrets and privileges gained as a Callimachan are not meant for you. Most times, however, assistance comes in less dramatic forms, such as emotional support and encouragement, or the sharing of a bottle of fine vintage Riesling. Callimachans can form tight-knit circles. While other Courts might label this as cliquishness, these groups are often very loyal and loving of members. Those yet to establish themselves in a group have ample opportunity to prove their value. Callimachus parties are often invite-only, and involve exhibitions of the latest poetry, successful spells, and performances in progress. If you can score an invite to their parties, you’re guaranteed to have a great time – or at least see something you can legitimately claim you’ve never experienced before. Callimachans are the most stylish on campus. Many express it through their fashion choices, with clothing pushing the limits of the dress policy and always stunning onlookers. (Occasionally, it’s literally stunning onlookers with mis-woven threadcrafting in their fabrics.) Other Callimachans take a somewhat bohemian approach, dressing simply, but using eccentric and bold mannerisms. The worst insult one can hurl at a Callimachan is “boring.” They are often trendsetters on campus, both in style and hobbies, but also political activism — when it suits their interests and values. When it comes to studying, Callimachans tend to be either diligent and dedicated or distracted, except for their personal projects. The former group can often be seen in the Cyril Danforth Radcliffe Library (CDR or “Cedar Library”) nose-deep in scrolls and tomes, divining their secrets. The library’s ghost, E. Ramis, is a fond friend to many Callimachans, and eerily relevant books often appear on the desk of a studying court member. While some criticize Callimachus’ penchant for the esoteric and unusual, the Court has also produced four of the last ten valedictorians and some of the most exceptional professors and researchers in the Magimundi. Callimachus has the esteemed duty to maintain Cyril Danforth Radcliffe Library and the signature magical artifact, the Arca Tenebrarum. This artifact was created by the Court’s founder, and enables mages and wizards to project scenes physically in the space around it, using an artifact or scroll as a source of reference. The latter group, however, follow the great tradition of the Court’s founder and its namesake in eschewing the banal, choosing to pursue the topics they feel best serve their personal growth. These students often wind up with a tutor late in their third year, or else many “Gentleman’s C’s.” They can be found working late at the campus café, sketching out new ideas for fabrics or runic configurations. Others can be seen trying out their latest invention with friends and unsuspecting bystanders. The poets in Callimachus often are performing or dueling with their latest creations in the common squares outside on campus. Some duels are judged on the merits of their lyricism alone, and others duel with their animated works of poesy. While the grades of these students may not be spectacular, an especially groundbreaking or innovative project can sometimes allow them to move into lucrative careers following their passions, though this “all fiddle spiders on one web” plan has seen far more failures than successes. Every semester, Callimachus hosts The Jabberwock, a showcase where members each present the work they are most interested in. It is a private tradition, as the presentations can be often personal and emotional, but alumni and friends may be invited. Each student has the spotlight shined on their pursuits, so Courtmates can be aware of and encourage them. It also is an opportunity for students to ask for feedback in a friendly manner. While Callimachans’ daily opinions on art and philosophy are often stated boldly (if not snarkily), The Jabberwock is reserved as an uplifting space. Poems, sketches, newly threadcrafted clothing, dance, songs, new spells, performance, and inventions are shared. In some cases, the ceremony provides an opportunity to help struggling students with guidance on whether or not Callimachus – or even Imperial – is a good fit for their academic needs and talents. While some traditions have lasted over the years, all have changed, and some hardly recognizable. Callimachus was the first Court to openly admit mundane-borns in 1832. Of course, additional precautions were put in place for the safety of other Courtmates, since mundane-borns lacked the benefit of the basics of Magimundi culture and use of magic taught from a young age. ** Likewise, Callimachus was the first to admit wizards from every Province, provided applicants illustrate their worth beyond whatever their upbringing may have lacked. Older alumni may still remember when the advancement ceremony required togas in the fashion of ancient Egypt or Greece! My, how things have changed! Ptolemy: Ptolemy students and their obsession with being “first” means they sometimes rush, missing the sublime and the beautiful. They also would like everyone to believe that they have the oldest traditions and heritages — close, but not quite. Callimachans respect Ptolemy members’ desire for innovation and newness, as well as their shared respect for abstract thinking. Paracelsus: Why must they be so hands-on and data-oriented? And they dabble too much on utility magics like herbology and toxicology. These deal merely with the properties of the existing and the known. (They’re just one step above cryptozoologists!) Callimachans do respect Paracelsans use of experimentation and search for new magical methods. Agrippa: Callimachans and Agrippans are the most diametrically opposed. Agrippans value order, law, systems, and incontrovertible proof; Callimachans prefer a little flair, chaos and mystery in things, and they will contradict Agrippan linear thinking and elitism. Callimachans do admire Agrippa’s art of magical architecture (sometimes arguing that it truly belongs under Callimachus’ purview) since building requires not only precision, but an artistic eye. Plus, all those buildings need interior design, a Callimachan specialty. Librarian*** E. Ramis haunts the Cyril Danforth Radcliffe Library and classrooms of Imperial Magischola. During life, they were known for their quirky sensibility, ability to find any book extraordinarily quickly, and fashionable body modifications (migrating tattoos, piercings, hair coloring, whatever was the current trend). E. Ramis was a widely loved librarian and a quiet proponent of non-human rights. Hobs and Trinkas applied in record numbers to be library staff during E. Ramis’ 36-year run as Chief Librarian. Unfortunately, E. Ramis’ time in that position ended with their tragic death in 1984 from compact shelving magic gone awry. If E. Ramis likes a student, they will find that the exact book they needed will slide slightly from the stacks. Cherished Callimachus students may find that books for suggested reading mysteriously appear on their desk. If unliked, especially if a book is overdue, E. Ramis has been known to visit at odd hours of the night for “gentle” reminders. * The Great Fuschia Incident was deemed to be so absurdly tacky that a memory charm has mostly concealed the incident’s details (including the ashamed artist). ** Callimachan students in 1832 undertook the uplifting of mundane-borns as a special thesis project, and the first two students were often paraded about as an artistic achievement, much like a costume, or another novel invention. We can assure that times have changed at Imperial, and mundane-borns are no longer considered tokens or curiosities. *** Technically E. Ramis is a former librarian, as staff members cease being paid once deceased. Callimachus was born in Cyrene, North Africa and died in his beloved city of Alexandria, where he accomplished much of his life’s work. He married, was educated in Athens, and was given a place in the Great Library of Alexandria by Ptolemy II Philadelphus of Egypt. To mundane scholars, Callimachus is well-known as a poet, scholar, and critic in the third century BCE. Unbeknownst to mundanes is the hidden magical history of the Great Library or the secret society of magic to which Callimachus belonged. Rejecting the popularity of epic works (“A big book is a big misfortune”), much of Callimachus’ own study and work was on shorter pieces, especially epigrams and poetry. Modern Magimundi historians point out that the relatively brief nature of magical incantations was likely an influence in his choice of writing. During his time, Callimachus helped innovate the understanding of the nature of magic words and symbols. The Library drew so many different cultures and languages and provided a wealth of source material for Callimachus. Leaps of learning sprang forth from him, as he was able to decipher patterns and variations between magic in different cultures’ written forms. This work led to many breakthroughs in multi-discipline magic and has left a lasting mark on magical theory. Callimachus was also known for his tributes to respected friends and scholars who had passed on. He would put on performance pieces that employed illusion spells crafted entirely of poetry. Several wizards wrote about how they were brought to tears of sadness and laughter from the poignant and stunning magical works done for the dead. At the time, not all magical works were separated entirely from the mundane. Callimachus conducted a thorough bibliographic survey of all of the works at the Great Library and helped develop categorizations for magical texts, which ensured their proper cataloging, care, and storage. Similarly minded wizards, many of whom who would travel from distant lands to study at the Library, worked with Callimachus. The most trusted of this group would form the Order of the Aeolian Horn, mystical librarians and archivists who swore to ensure the continued protection and availability of magical scrolls and other ephemera to all worthy wizards. Their motto, “pulvis et umbra sumus” (we are dust and shadow) is secretly inscribed in works under their care. Families throughout history and across geographic regions and cultures are chosen to ensure that the knowledge carries on. Notable families in the Order were Feng, Zephyrous, Salkhi, Windwalker, Kaze, and Ruzgar. Scrolls and artifacts were housed in libraries at Alexandria, Pergamum, Serapis, Villa of the Papyri, Royal Library of Ashurbanipal, Ugarit, Nalanda, Timbuktu, Shi-Wu libraries, Constantinople, and more. When the Great Library of Alexandria was burned, long after Callimachus’ death, the stores of magical knowledge were safely smuggled out by members of this Order, thus avoiding the horrible fate of the mundane collections. The choice of Callimachus as the namesake for the Court reflects the respect that founder Firenzum E. S. Radcliffe Zephyrous had for the old masters and a firm grounding in classics. It also reflects the desire to create fresh new ideas from these sources, to unlock new secrets, and innovate the magical world, as Callimachus did. Firenzum Edward Smith Radcliffe Zephyrous’s life is a fascinating journey. At a young age, he was an actor in Shakespeare’s troupe, The King’s Men. Discovered by the Radcliffe family as a mage, he traveled with Humphrey and Millicent Radcliffe to the New World and learned to hone his magic under private tutelage, then joining his brother Roland to be part of Imperial’s founding class. The two were partners for years, writing plays and researching new variants of illusion magic. Firenzum later joined the Imperial faculty by creating a powerful artifact that could recreate a temporary reality based on scrolls, books, or artifacts nearby. “We find the greatest treasures in the most unusual of people” – M-W F.E.S.R.Z. Known typically only by their chosen name, Firenzum, his impact on the legacy of Imperial was profound. Callimachus Court is the one that values the individual, whatever their unique traits and interests. Firenzum broke all sorts of boundaries in terms of decorum, both magical, fashionable, and social. In his final years, he traveled abroad, lecturing and reciting poetry. When he returned to the New World, he encountered the ugliness of the mundane extremist witch hunts. He aided both wizards and mundanes, before returning to Imperial and leaving this world at 103, with scores of friends, admirers, lovers, and a beloved daughter.